In the American Heritage Center’s largest storage area. During the month of October, you’ll be able to read profiles of many AHC faculty and staff members. We’ll feature individuals who work in different departments to show the wide range of responsibilities that encompass “archives work.” If you have questions that you’d like to ask, please feel free to post them as comments on the blog and we’ll be delighted to respond. 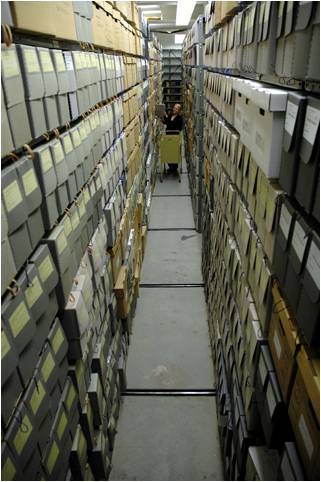 I am so thankful for all the archivists in the world who preserve everything. I am a “professional snooper” as someone at the AHC referred to me last month. Thank you to each and every one of you archivists. Thank you, Shirley! Those are very kind words!